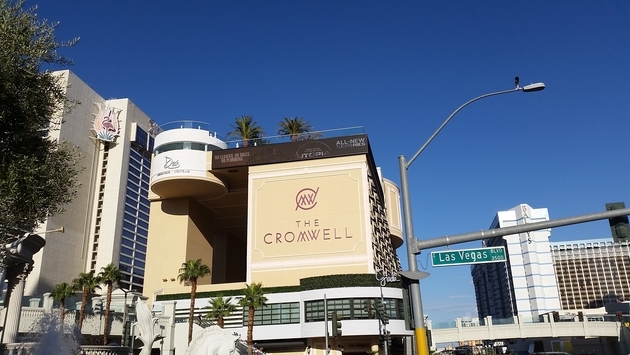 The Cromwell came with lots of expectations when it opened earlier this year in Las Vegas. The Caesars Entertainment property was not only replacing the historic Bill’s Gamblin’ Hall & Saloon, but it was also welcoming celebrity chef Giada De Laurentiis, as well as a new day club/nightclub by Victor Drai. Marketed as the only standalone boutique hotel in Vegas, the Cromwell promised a “modern meets vintage” style, paying tribute to the past while keeping up with the times. But did the Cromwell meet expectations? Here’s TravelPulse’s take after staying at the hotel via the Las Vegas Convention and Visitors Authority (LVCVA). OK, so a 188-room hotel may not be your standard boutique, but in Vegas—where it’s not uncommon for a hotel to have thousands of rooms—it may as well be. The question is: Does the Cromwell have a boutique feel? 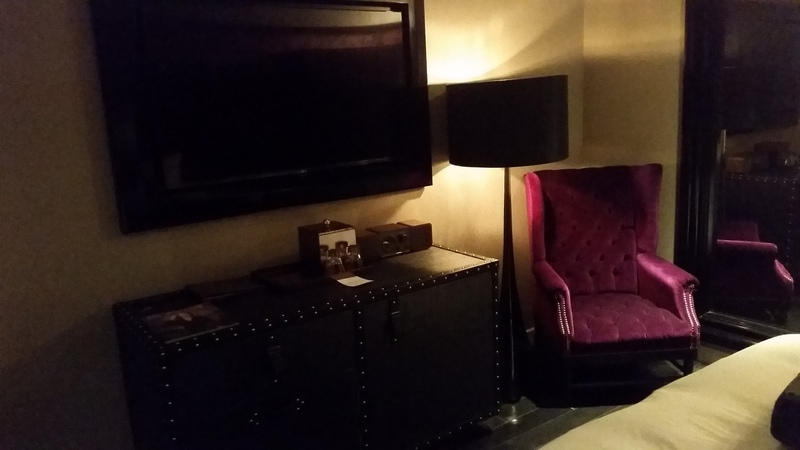 I stayed at a standard 360-square-foot King room at the Cromwell. While that may seem a bit tight for some, a) it fits with the boutique style and b) it does well with the space it has available. There is a Luxury King room and a Deluxe King room. The Luxury King room has a view of the Strip, which is particularly noteworthy because the Cromwell sits right on the corner of Flamingo Rd. and Las Vegas Blvd. The Cromwell also has similar Queen rooms and four types of suites that range from 723 square feet (the Parlour Suite) to 1,730 square feet (the Cromwell Suite). The Cromwell Suite can be extended to 2,550 square feet with connecting room options. 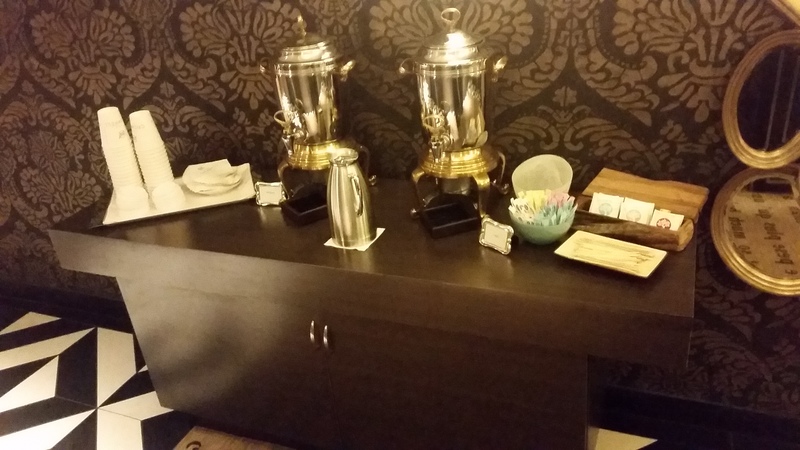 Nice touch: Each hallway has a table next to the elevator with complimentary coffee and tea. The coffee and tea is changed regularly throughout the day. As an ode to the past, the historic Drai’s After Hours is situated in the same basement as it was more than 15 years ago, albeit renovated. But the new attraction from Drai—one that bears noting—is Drai’s Beach Club Nightclub, a rooftop day club/nightclub that makes sure to cater to partiers whether they want to lounge by the pool on a hot day or dance to live music at night. The entire day club and nightclub is 65,000 square feet. The whole space holds about 4,700 people. During the day, lounge on one of the 15 Mezzanine level cabanas or one of the 10 lower bungalows. 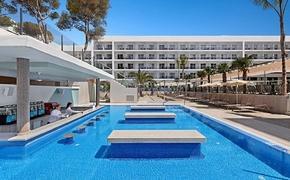 Or you can sit back on one of the 40 daybeds. Surrounding you is eight pools, two main bars, an outdoor DJ booth and LED façade, and 10 35-foot palm trees. At night, catch some bumping music on one of two levels. Don’t worry, there are plenty of LED lights inside: a whole 4,400-square-feet of them. And there’s also a 1,785-square-foot LED screen. For ritzy clubbers, reserve one (or seven) of the 150 VIP tables. Oh yeah, and fireworks are sometimes shot off into the sky, too. There’s that. No doubt about it: Drai’s Beach Club Nightclub is a sight to behold, and a hotspot that lives up to the hype. For extreme partiers only: Make it a full day. Hang out at the beach club from 10 a.m. to 7 p.m. before partying at the nightclub and Drai’s After Hours until the wee hours of the morning. You may not be able to see straight afterward, but the photos will remind you it was worth it. Let’s be frank: If Giada De Laurentiis never opened a restaurant, she would be just fine. Her work on “Food Network” alone has been enough to catapult her to fame. In that sense, opening up her first restaurant at a highly publicized new Caesars property was a bit of a risk for the celebrity chef. But when TravelPulse talked to De Laurentiis in April during a preview event of her new restaurant, Giada, she said that she felt this was the right time and believed it was important to inject a female’s touch into Vegas’ culinary industry. So far, so good. Giada was excellent, as expected. 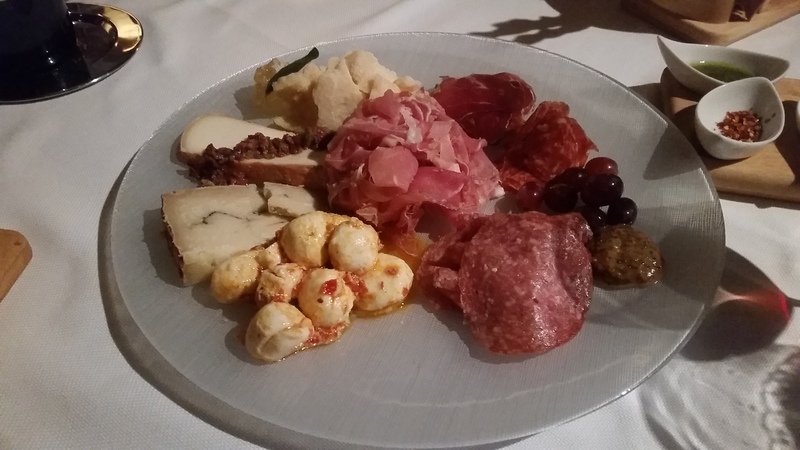 My media group was treated to several small platters and a main course. From delectable cheeses and meats to various pastas and seafood dishes to the steak, everything was mouth-watering. Even the bread—from the homemade focaccia to lemon thyme flatbread to Parmesan breadsticks—was delicious. There are also…wait for it…bacon-wrapped dates. Beyond that, there’s an antipasti bar. Add in the retractable windows that look out onto Flamingo Rd. and Las Vegas Blvd. and Giada has location, too. I can’t say I’m surprised. De Laurentiis has built quite the career for herself. While it’s always a tall order opening up your first restaurant (let alone on the corner of Flamingo Rd. and Las Vegas Blvd. ), you figured De Laurentiis would be up for the challenge (in fact, she had a detailed and dedicated hands-on approach from the very beginning, from the food and drinks to the design of the restaurant). 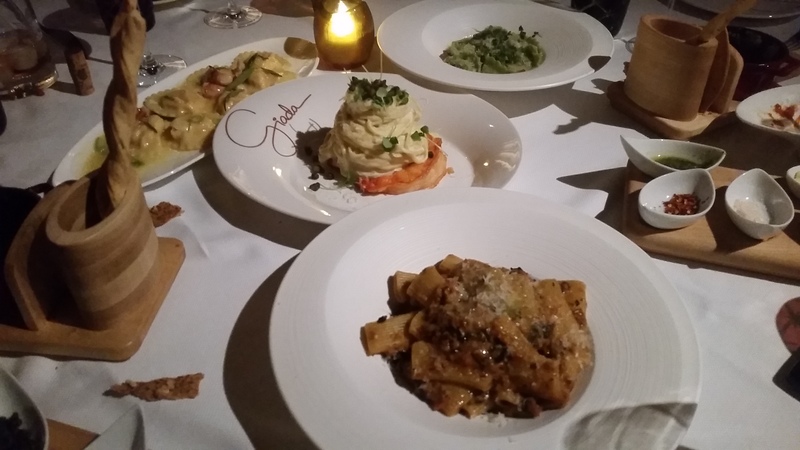 It may be difficult to get a table at Giada these days, but once you sit down, it was well worth it. Nice touch: Giada also has dessert carts that are rolled over to you after dinner. Just make sure you don’t need to be rolled out of the restaurant when you are done.